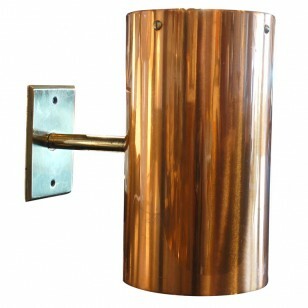 United States, 1950s These striking copper and brass sconces were custom-made in the 1950s and have been expertly repolished. The arm extends 5.5″ from the plate. Four sconces available. USA, 1960s One of Baker Furniture’s well-crafted Hollywood Regency offerings, this coffee table comprises a radiating eight-leg wood and brass base and a scalloped tray top of glass rimmed in solid brass. USA, 1950s Designed by Paul McCobb for Directional, this coffee table is composed of a round travertine top and a brass base. USA, 1970s This dining table by Mastercraft features a sculptural faux bamboo base in brass and a racetrack glass top. Without the glass, the base measures 55.5″ L x 38″ D x 28.5″ H.
Unknown, 1950s Brass hanging lamp from the 1950s featuring five milk glass shades with subtle painted linear details. One extra shade included. USA, 1970s This coffee table, designed by Bernhard Rohne for Mastercraft, is composed of a lacquered wood frame with iridescent acid-etched brass panels and a beveled glass top. USA, 1950s This large, low coffee table has been expertly refinished. With two spacious drawers it provides plenty of storage as well as surface area. Finland, 1940s This unique ceiling lamp, designed by Paavo Tynell, is composed of a suspended pierced brass shade that houses three light sockets. USA, 1970′s Beautiful custom made sconces.